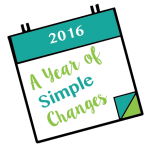 Something SUPER EXCITING is happening here, along with Treasure Chest Ministries we will be releasing a FREE twice monthly newsletter talking about simple changes you can make through out 2016. Simplicity sounds nice right? But how do you get there? What does it look like for your house? Owning only 333 things or just cutting out the excess? Why does living a simple life seem so overwhelming? Join us on a journey to make simplicity truly simple.